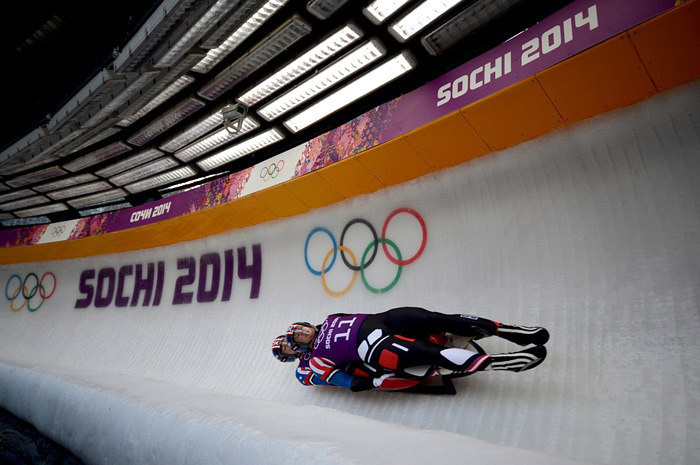 Luge is billed as the fastest sport on ice. Competitors race down a specially designed track feet-first only inches from the ice. Luge was added to the Winter Olympics program for the first time in Innsbruck in 1964. Also read information about the skeleton event, a head-first version of the luge. There are four events in Luge: Men's Singles, Women Singles, Mixed Doubles and Mixed Team Relay event. The mixed team relay event was added to the program in 2014. The mixed team relay involves one sled from each of the other three events. The mixed doubles is essentially a men's event, as although women are able to compete in teams, they seldom do. The first year that luge was on the Olympic program in 1964, sadly a British luger died in the course of a practice run a week before the competition started. In Grenoble in 1968, East German luge competitors Ortrun Enderlein and Anna-Maria Muller - in contention for a clean-sweep - were disqualified when it was discovered their toboggan runners had been heated. In Nagano in 1998, German luge great Georg Hackl became just the sixth Winter Olympian to win the same event in three consecutive Games. Then in 2002, he won a silver to become the first athlete ever to win five medals in one event. The $105-million sliding center on Blackcomb Mountain’s southeast side used for the 2010 Olympics, has 16 turns and drops steeply for 152 meters (500 feet), which is the world’s longest drop for such a course. A Georgian luger Nodar Kumaritashvili was tragically killed in a training run crash after flying off the Olympic track in Whistler, Canada in the day before the Games were to begin. In 2018, US luger Chris Mazdzer became the first non-European to win a medal (silver) in the men's singles event.